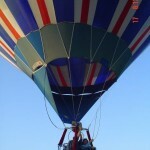 Tim Orchard is a balloonist. He also holds the record for the fastest ever crossing of the Atlantic by commercial airliner (like with passengers sipping champagne on board and all that Henley-type stuff yah). He, along with Captain Leslie Scott and Senior Engineering Officer Rick Eades, managed to get their Concorde, G-BOAD, from New York to London in the amazing time of 2 hours, 52 minutes and 59 seconds. This record will probably never be broken. Quite an achievement. “Here come and have a look at this”, said Tim one dismal day a few years ago. I was ushered into a quiet hangar at Wycombe Airpark where these days Tim reigns supreme. Under a blanket at the back was a pair of Concorde seats. He looked at me and me at him (not to be confused with a popular Kinks number) and we both smiled one of those long all-knowing well understood silent beamers. Simple request really. Could they fly again? Blimey all my dreams came true at once. I’m like the vast majority in that, forgetting I could never afford it, have never flown on Concorde. I have quite a few very powerful memories of Concorde but probably the best was with youngest Alice on Uffington Hill standing on the eye of that wonderful horse. We sort of heard it first, a distinctive quietly powerful deep rumble. We both knew what it was without seeing it. As we looked up the clouds parted for a moment or two and there she was, dashing across the blue gaps in amongst the white and grey stratus, a glistening arrow heading for America. Never before were Pete Brown’s Piblockto’s words so poignant, ’The smoky trails where skymen ride their slashing silver swords’. In a moment she was gone, vanishing back into her own realm and becoming a distant thundering roar mopping up the miles as it headed for Devon and Cornwall and the Atlantic beyond. I think we were all proud of Concorde, and those that had the greatest privilege of all and actually flew her. Young and old (and those in the middle) all recognised Concorde. Farmer friends of ours in Devon set their watches by the sonic boom as it shot out over the Atlantic. It was simply fantastic, a thing of beauty and grace. I’m OK now, the emotions calmed. These seats had so much history in them. Who had sat in them? Where they from BOAD? Tim couldn’t possibly say but he did have a release note for them. They were deemed fit for service. Tim also had a Lindstrand 77 with a turning vent so it looked like a plan may be unfolding. His idea was to make a duo-chariot out of them. 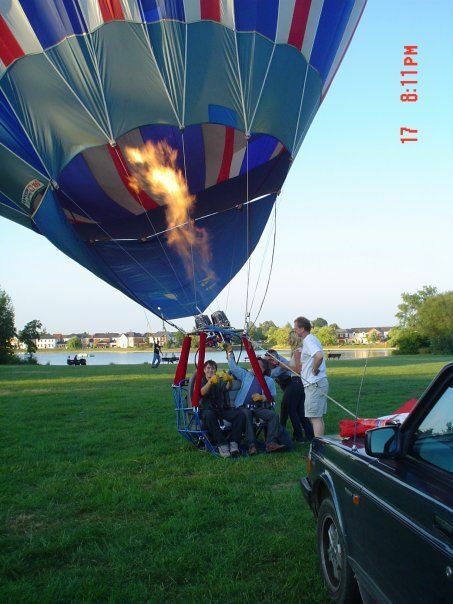 A simple thing with a double burner that he could fly under his balloon. Now this is all very well but two things popped up almost instantly in my mind. It was so high profile it would have to be legal and it would have to look the part and do Concorde proud. Very gently, like some sort of priceless antique purchased from Bonhams, the seats were loaded onto the pickup and taken back to base. 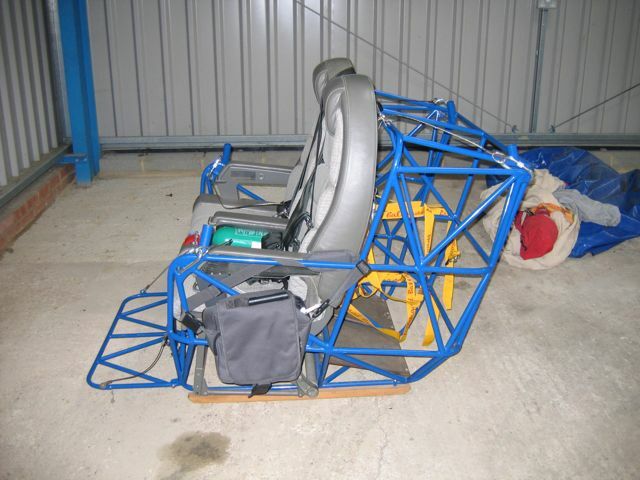 Little did we know then that it would be a few years before the dream became reality, not through the time taken to create the airchair but the time it was going to take to get the paperwork into place. Starting from scratch it was decided to go for a proper Duochair with a good duration, after all we had a ’77 to put above it so a good fuel load would be no problem. 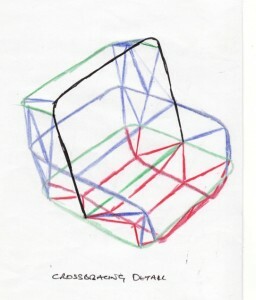 The seats and frame would be left unaltered if at all possible. We settled for two 60 litre cylinders and a Lindstrand double burner, not quite the four Rolls Royce Olympus engines of the original but pretty pokey nonetheless. To keep costs down (which like the original project were bound to overrun) we opted to keep the burner and its frame standard so at least we wouldn’t need a dedicated burner. Since moving into the new workshop we had a pile of electrical conduit leftover so that became the material for the mock-up. If we built a pattern Tim knew a certified (not mad) welder that could replicate it. As it turned out the welder was none other than Paul Sawney who soon became a kindred spirit and good friend as he loved pre ‘65 trials bikes and anything pushbike. Our sort of chap. I spent a few days thinking out how it would be and then galvanised, like the conduit, into action spent a weekend building the mock up using an old plumbers’ pipebender and mig welder so as to cut down a bit on the fumes. This was going to be a work of art rather than a mere Duochair. I wanted it to look and feel Concorde. Difficult in conduit but achievable I felt. 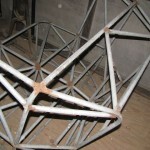 The framework followed sixties Formula One space frame technology. Very sixties. 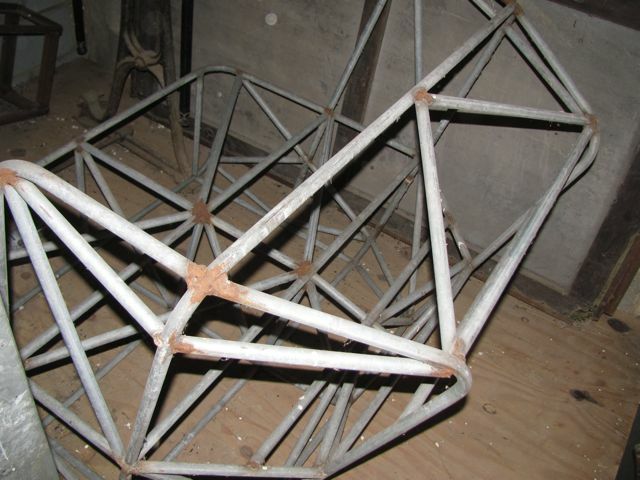 It was made up of four main hoops all interlocking and crossing each other and braced. Curves were paramount to absorb a rear facing landing. 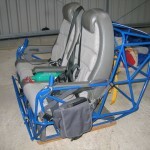 It had to be light and yet look supremely confident and safe and it had to be created around the seats rather than a frame to plonk the seats into. As the hoops and bracing came together it just started looking right. 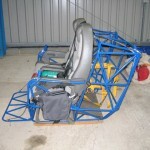 By the time the seats had been fitted and the tanks and burner put in place we had one powerful solid looking machine. It was looking like it meant business. 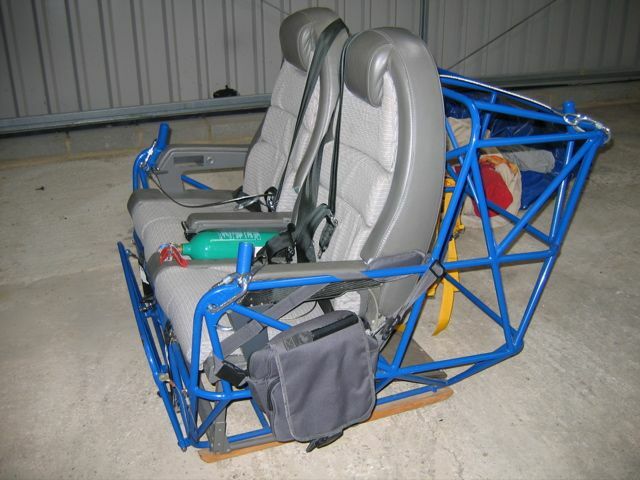 One afternoon, a week or so later, I sat in the lefthand seat of the finished mockup and it did feel good. Living art. It was a while since I’d done anything arty farty so it had been a pleasure. Tricky thing balancing practicality, functionability and art. Rust is a problem with conduit! With the finer details worked out we decided to go for the real thing. The trusty pickup was duly loaded and off we set for Booker. Tim was kept in the dark about quite what had been created. Paul stroked his beard and wandered around the art form. “Any drawings?” he asked. Stupid question on reflection. “No but can you copy it?” A moment more of head and beard scratching. “Yes but it’ll cost”. We looked at each other again and started laughing. This was going to be good. We decided it best not to tell Tim about the ‘cost’ bit just yet!!!! When you weld tubular frameworks it is very time consuming. Angles are not easy and if butted tubes are going to have any strength then they have to be shaped and chamfered just right. You can’t just gob up gaps with weld in these circumstances. 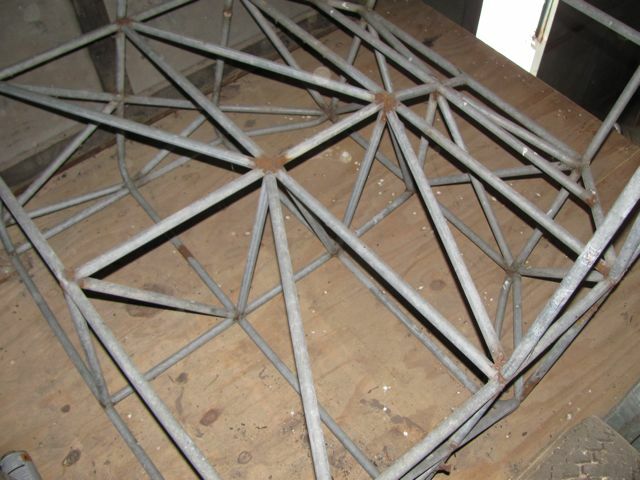 This was not a simple job as it had so many angles and bits of bracing. We discussed losing a few but decided it just wouldn’t look right although it definitely wouldn’t compromise strength! A month later and Paul called to say it was all but finished and ready to be fully welded. It was sat next to the mock-up in the middle of the hangar floor. It was just perfect, a true replica, and it looked really neat. 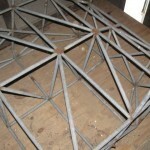 The following week it was finished having been turned and turned again to weld up all the tricky angles. By God it was strong but better still, having been made from thin-walled aviation grade tube, it was incredibly light. This was going to be stonking. Over the next few weeks we test rigged it, stole Barry the Aviation’s (he owns a Mitchell bomber) lorry and Hiab and test lifted it. Cables were ordered from Lindstands and drawings made, often the best way to design anything. 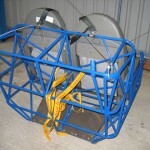 The loadings all came well within limits and the frame got powder coated in BOAC blue and a folding footrest was added. We told Tim it was Orange! He didn’t seem very amused. 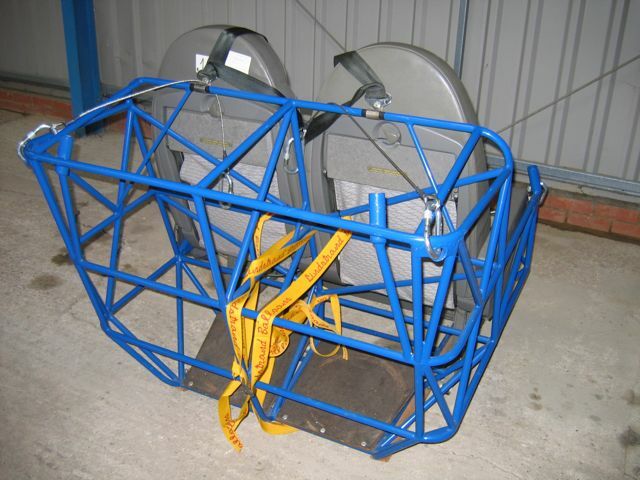 At last it was finished, Barry rummaged around his yard and came up with a couple of nearly new five point harnesses and we figured out an easy way to make the blast valves easier to operate using turned aluminium leg extensions off the mother-in-laws old persons’ chair. Meanwhile Lindstrands good bloke Simon Forse set about trying to get the Concorde seat approved. Days turned to months, months to a year and we were going nowhere. Finally over a pint or four we decided it best to test fly the creation. We were getting fed up with having to keep it under wraps in the back of the workshop. It wanted to fly. A chosen few, including my dad whose brother, was a senior captain in BOAC and my dog (Ferrit in those days) had got to sit in it. Flight was so tantalizingly close it just had to be done. We needed a balloon with turning vents. We had one but it was a bit large being a 105. Never mind. Midweek on a probably tad too windy an evening we went to a hidden location and on a southerly (a direction where no one lives) accidentally launched into a fine sky. 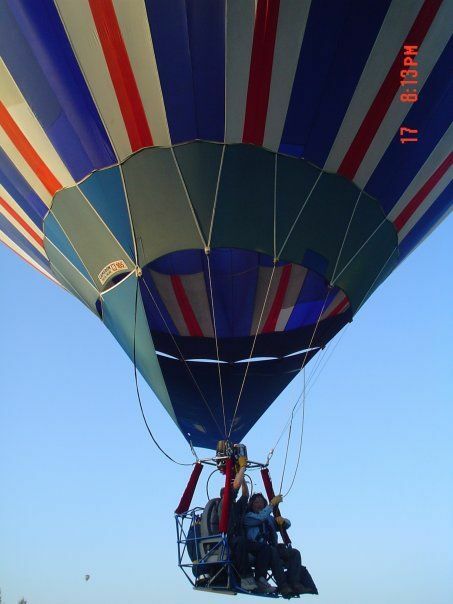 Accompanying balloonists were sworn to secrecy. I took our Pete who had just checked out. He had the rotation vent lines I had the red line. May have been the other way round! We passed low over bemused farmers busy baling and cars that pulled up to see what all the laughter was about. It was good. Not good but seriously grin-beaming loud-laughter good. It was a nicely quick. 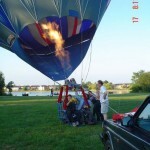 The 105 was barely inflated with such a light load so the turning vents took a while to do anything. We treated them as dump valves and sweeping low across the London Birmingham railway line we touched down painlessly, sliding backwards across a scrubby field finally coming to rest on our backs laughing out loud. Think the earlier grins were big? They were now huge! Whoops lost a bit of the picture but airborne at last. Concorde, or a bit of it, had flown again. Some months later Simon finally came up trumps with an official bit of paper so it could be flown with Tim’s ’77. 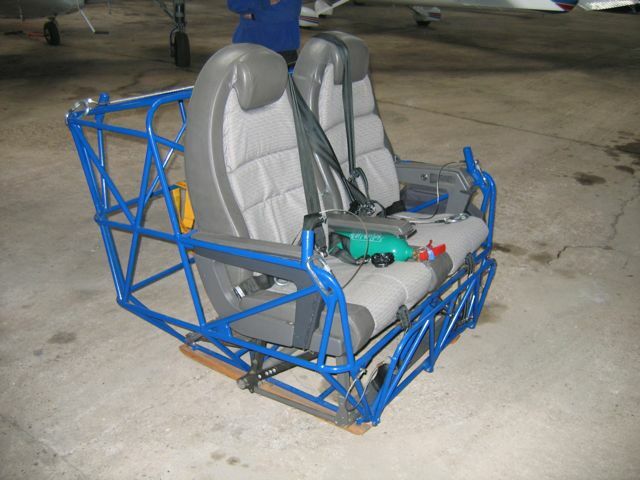 It was designated as a Concorde Skyseat. Neat name. We put an extra turning vent in the ’77 just to make life simpler. Tim went off to the museum at Brooklands and tethered it alongside Brooklands’ Concorde G-BBDG, a pre-production model. Finally we could announce that a bit of Concorde had once more taken to the skies. The first time I saw Concorde in real life was down near Fairford. I went with a mate of mine, he on a Velocette 350 me on a Boyer Bonneville 650. His aunt lived in a caravan a few miles from the airfield where the testing was taking place. We had barely arrived when it came over, wheels and nose down, seemingly hanging in the air like some sort of prehistoric bird, a Canberra close by. It was a grey old day and we decided we had glimpsed the future. That future was never surpassed and I doubt it ever will be. Everyone recognised Concorde and everyone looked up when she flew over. Can’t be many planes, apart from the Spitfire, that ever got that sort of accolade or remain so iconic. Last flying Concorde I saw went over my head as I went round the M25 with our Pete, the traffic bunched up as everyone slowed to watch the glow from the afterburners as it climbed purposefully away into the early evening sky. Tim’s record breaking G-BOAD first flew on 25 August 1975 from Filton and clocked up a staggering 23,397 hours (her seat a bit less!) She departed from Heathrow for the final time on 10 November 2003, and flew to JFK airport in New York where she was then shipped by barge to the Intrepid Museum, New York. In December 2006 she was moved to Floyd Bennett Field in Brooklyn where her condition deteriorated until in 2008 she was moved back to Pier 86 in Manhattan and this time placed on the pier, rather than left on the barge. In contrast the seats reside in Tim’s heated garage coming out to take part in charity events on behalf of British Airways. The pattern is in our store awaiting further development into something a bit simpler to build! A huge thanks to Tim for his vision, patience, and forbearance. 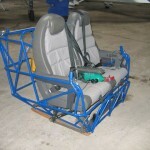 Hopefully, one of these days, I’ll get another go in those seats, maybe with Captain Tim on the blast valves. Now that would be one for the logbook!